Trade and tariffs will dominate the world’s headlines later this week and over the next couple of months; and Southern Nevada business leaders are urged to pay attention because of the potential impact on economy and their costs. 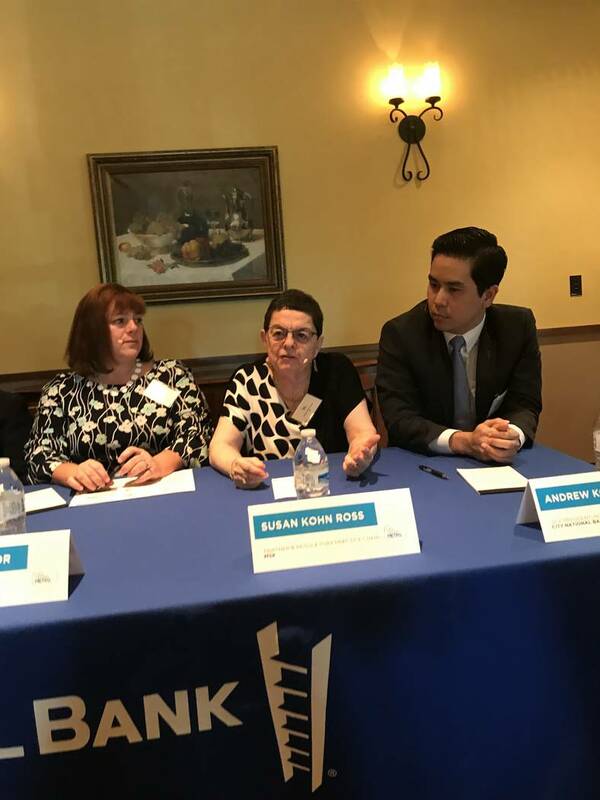 That was the takeaway from a recent luncheon hosted at Panevino by the Las Vegas Metro Chamber of Commerce and City National Bank. Panelists addressed concerns about higher costs for construction materials and retail goods and a slower economy that impacts consumer spending and travel. Canada and Mexico are two of Nevada’s largest trading partners and on Nov. 30, President Donald Trump is scheduled to sign an updated version of the North American Free Trade Agreement that was adopted in 1994. Trump is scheduled to meet with Chinese President Xi Jinping in Argentina this weekend as the world watches whether there will be ceasefire in the trade war between the two nations. Canadian Prime Minister Justin Trudeau also plans to meet with Trump over steel and aluminum tariffs enacted last summer. Mexico, which has a new president Dec. 1, has indicated it won’t sign any deal unless Trump lifts tariffs against it. Mexico and Canada retaliated by imposing tariffs on U.S. exports. Some analysts have already attributed the trade war to reducing the forecast for the U.S. GDP growth in the fourth quarter and into 2019. Some dire predictions have it fall below 2 percent in the fourth quarter after reaching 4.3 percent in the second quarter. The tariffs and trade war and impact on the economy is one of the reasons for the steep decline in the stock market this fall. There’s already in place a 10 percent tariff on $200 billion in Chinese goods (industrial goods and components) that’s scheduled to increase to 25 percent Jan. 1. President Trump also has threatened additional tariffs on $250 billion in Chinese goods that don’t already have those duties — a move that could increase the cost of many consumer goods, analysts said. Kohn Ross said there’s already been large increases in steel prices that impacted all level of housing and commercial construction, and doesn’t see that lessening anytime soon. That extends to government projects as well, and could mean there’s less government money to spend on infrastructure. “You have a president and Democrats who said they want to make a deal on infrastructure, but is this one of those unintended consequences,” Kohn Ross said. President Trump, meanwhile, continues to face opposition from U.S. trade groups who represent companies that worry tariffs hurt their bottom line. Nevada had $12.1 billion in exports in 2017 to more than 100 countries, much of it related to the state’s mining activities and gaming equipment and components. Canada, China and Mexico ranked behind Switzerland and India — $1.2 billion for Canada and $800 million each for China and Mexico. Hong Kong is sixth at $352 million. In its trade with Canada, some 29 percent of the exports are computer and electronic products; 18 percent is miscellaneous manufactured commodities; 11.5 percent is minerals and ores; and 8 percent primary metals. Nearly 60 percent of the exports to Mexico are computer and electronic products. In trade with China, some 38 percent is computer and electronic products, nearly 32 percent is minerals and ores, 13.3 percent is chemicals and 5.6 percent is food manufacturers. 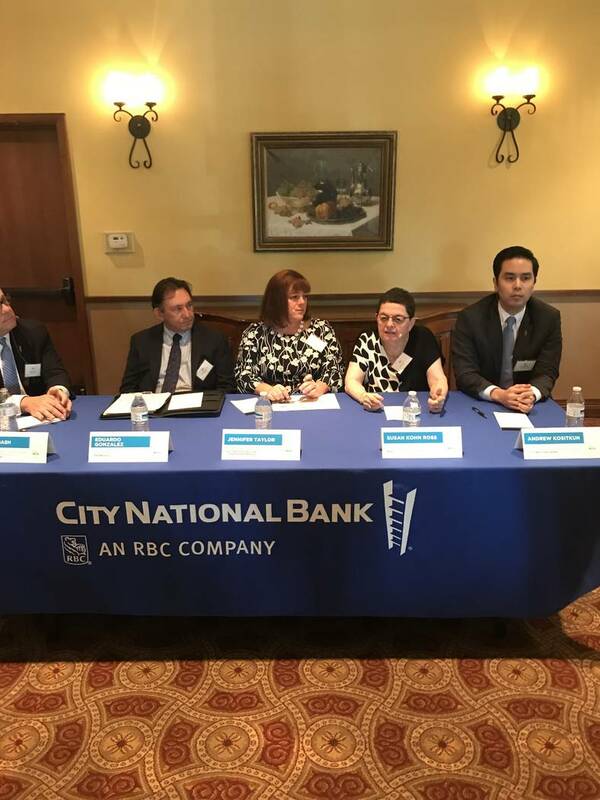 Steven Bash, senior vice president of international banking, trade and finance for City National Bank, who moderated the program, said trade stories are traditionally in the back of the newspaper. But it’s now major headlines that businesses need to pay attention to and get educated about since trade helps grow business. For now, Nevada doesn’t have many products from China on the tariff list compared to other states, Bash said. China has hurt the U.S. in the states that support President Trump, especially with agricultural products, he said. In July, the U.S. Chamber of Commerce said $107 million in exports from Nevada were subject to retaliatory tariffs, including playing cards, steel and breads. About 367,800 Nevada jobs are supported by trade. Bash said a lot of companies stockpiled goods and products ahead of the tariffs going into effect and it won’t be until the first and second quarter of 2019 to say how much the tariffs will have an impact. Earlier this year, Bash was appointed to the U.S. Department of Commerce Trade Finance Advisory Council. Andrew Kositkun, a vice president with City National Bank who deals with international trade, said the trade issues the U.S. has with China are vastly different than it has with other trading partners such as Canada, Mexico or European Union. “With them, it’s mainly an issue of what level the tariffs are going to be set at; but with China it’s a much more complex and structural issue,” Kositkun said. Kositkun said there’s skepticism that anything will be resolved soon, especially with politics involved. Polls show Americans of all political stripes don’t see China as a fair trade partner because of the growing trade deficit, and that “is a political winner” for President Trump, he said. Many congressional candidates who were against tariffs lost while those in favor won their races, he said. “That says it’s important and politically a winner that reduces the likelihood of the United States giving in on these demands,” Kositkun said. Kohn Ross said, however, that once tariffs start covering consumer goods and that list is expanded, there will be a different reaction from the American public because it impacts everyone’s pocketbook. People aren’t seeing that now with steel and aluminum tariffs, he said. “I think the dynamic will change if there’s not a resolution of the tariff situation,” Kohn Ross said. Despite all the trade issues, Jennifer Taylor, director of operations for the Business Council of Canada and Nevada, said Canadian companies are looking at Nevada, and they still see opportunities in the state to set up shop, do direct investment and trade. “A lot of Canadian business leaders I dealt with are talking about the specific opportunities in the state and putting aside the discussions of trade at the international level,” Taylor said. “They look at Nevada as a robust place to trade,” and tourism from Canada to Nevada remains undaunted, she added. More than 80,000 jobs in Nevada depend on Canada, Taylor said in citing mining operations. “This is a country that’s always looking to Nevada in particular as a place to do business,” Taylor said. Mexican Consul Alejandro Madrigal Becerra, a guest in the audience, talked about Las Vegas having about 1.2 million Mexican visitors a year, second to Canada that has more than 1.4 million a year. Some 60 percent of Mexican visitors come from international flights and 40 percent use domestic, primarily from California and Texas. Trade and jobs associated with it helps Mexicans travel abroad, he said.